• Do not use monocular to look straight at the sun, or your eyes will get hurt. • Put it away in dry places if not used for a long time. • Wipe the lens with clean cloth. Steep the cloth with some ethyl alcohol to remove stubborn stains. 40X60 High Power Magnification - Have the best view in your outdoor adventures. To see 10X closer with a clear and bright image with the generous, light-gathering 42mm objective wide lens. Large BAK-4 Prism Inside and Fully Multi-coated Lens Coating - Strengthen the key function of a monocular, guarantee superior light transmission and brightness, make your view brighter, clearer and delivers crisp images. Portable Smartphone Holder & Tripod - Compatible with iphone X, 8plus, 8,7plus, 7,6, 6s, 6plus, 5, 5s, 4s,SE, Samsung GALAXY S8, S6, S6 Edge, S5 , Note, LG, HTV, Sony, and almost all other smartphones on the market. Solid Framework and Shock-absorbing Rubber Armor with Stripes - Its tight fitting protection makes it usable to withstand the toughest weather conditions. And The rubber armor with stripes makes it comfortable for use and keeps it from slipping out from your hand. 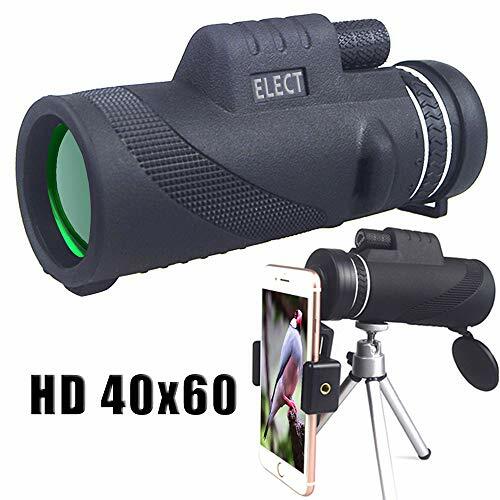 Waterproof&Dust-proof&Shockproof Design - Nitrogen-filled waterproof and O-ring sealed optics prevent moisture, dust and debris and ensures the living waterproof function. If you have any questions about this product by Electrilucn, contact us by completing and submitting the form below. If you are looking for a specif part number, please include it with your message.